emily lam | blog: Wontons!!! 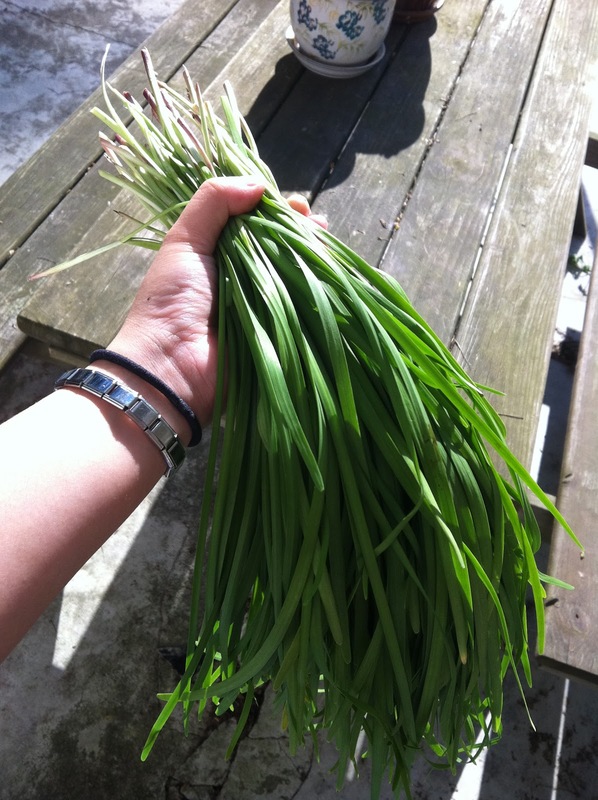 First, I cut fresh chinese leeks from my mom's garden. (My mother grows in our yard an assortment of fruits and vegetables: cucumbers, tomatoes, peppers, peaches, etc.) 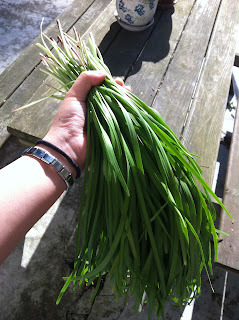 If you don't grow chinese leeks in your yard, you can probably get these at the local asian market. Next, for me at least, I picked out the dried out yellow ones. But if you bought your leeks at the market, there shouldn't be any dried out yellow ones. Here's the chinese leeks I collected, dried out yellow ones picked out. Then I washed and chopped them into tiny half centimeter pieces. Here they are washed and chopped. This next part, I didn't really do anything. I'm like afraid of touching meat. No lie. I know, laugh. But it's true. I'm also much better at preparing than the actual cooking. So my mother did this part. She added ground chicken (we normally use pork but the market my mom went to today was out of pork. We sometimes also add shrimp. But not today. It really just depends on personal meat taste. But no beef! My mother says you can't eat chinese leeks and beef in one sitting. *shrugs* Bad for the stomach or something like that.) Then she added an unknown – to me – amount of salt and sugar and an egg. Mix it all together and it becomes this disgusting looking paste. Next is the wrapping part. I forgot to take a picture of what the wraps look like. But like the chinese leeks you can buy then at a local asian market. Today I set a new record. I wrapped a whole plate of wontons. Normally, I'm just so slow that I wrap probably maybe a handful. I guess 19 years of trying paid off. And sorry, I'm not even going to try to explain how to wrap these. You are just gonna have to wing it. And that's it for Half-Recipe Wednesday!!! On another note: My mother also grows strawberries and today I had the best strawberry ever! It's 100% natural. YUM!!! This little strawberry was like the size of a penny. But it was DELICIOUS!